If someone comes onto my land and gets hurt, am I liable? No, except in rare circumstances. Maine has a strong law to protect landowners, known as the "landowner liability" law (or the recreational use statute), Title 14, M.R.S.A. Section159-A. Per the statute, if someone uses or passes through your land or passes for outdoor recreation or harvesting, with your permission or not, you assume no responsibility and incur no liability for that person's injuries or damage to their property. And similarly, if you allow volunteers to maintain or improve your land for recreation or harvesting, you are protected from liability for their injuries. Premises means improved and unimproved lands, any private ways, roads, buildings, or structures on those lands, and waters standing on, flowing through, or adjacent to them, and it also includes railroad property, railroad rights-of-way, and utility corridors to which public access is permitted. Recreational or harvesting activities are recreational activities conducted outdoors, including but not limited to hunting, fishing, trapping, camping, environmental education and research, hiking, rock climbing, ice climbing, bouldering, rappelling, recreational caving, sight-seeing, operating snow-traveling and all-terrain vehicles, skiing, hang-gliding, noncommercial aviation activities, dog sledding, equine activities, boating, sailing, canoeing, rafting, biking, picnicking, swimming, and activities involving the harvest or gathering of forest, field, and marine products. It includes entry of, volunteer maintenance and improvement of, use of, and passage over premises to pursue these activities, but does not include commercial agricultural or timber harvesting. Occupant includes but is not limited to an individual, corporation, partnership, association, or other legal entity that constructs or maintains trails or other improvements for public recreational use. Is the legal protection the same if I post my land "No Trespassing"? Yes. As a practical matter, your legal protection is the same whether or not the land is posted. Is it still possible for me to get sued in spite of the landowner liability law? Yes, but it is very unlikely because (a.) a person who sues and loses must pay the landowner's legal fees and court costs, and (b.) the law protects landowners so clearly that there is little opportunity for the injured person to win. In fact, there has not been a single reported successful case against a landowner where the Maine Landowner Liability law applied. If I am found not liable in a court of law, do I have to cover my court costs? No. In that case, the court will award you any direct legal costs, including reasonable attorneys' fees. Does my homeowner's or farmer's insurance provide me with protection from claims? Under most homeowner's or farmer's liability insurance policies, the insurance company has the duty to defend, or to pay the costs of defending any lawsuits brought or threatened against you. And if you are found liable, the insurer usually has the duty to indemnify, or to pay the damages assessed against you. Although each insurance policy has its own coverage and dollar amount limits, most home and farm liability policies will cover personal injury actions against landowners. For all practical purposes, these policies assure landowners of a paid defense of any claims made against them and assure that judgments against them will be satisfied up to the dollar amount of the policy limit. Be sure to check with your carrier regarding your specific coverage. Are there situations in which the landowner liability law does not protect me from liability? Use common sense. Avoid creating or allowing clearly dangerous situations on your land; and if you wish to block a road or path with a gate or other obstacle, do so with markings that are clearly visible day or night. Am I still covered by the landowner liability law if I charge a fee to use my land? Maybe. In general, landowners running commercial recreation on their land, such as commercial campgrounds and ski areas, are not protected. However, landowners do not automatically lose their protection if they charge fees. The landowner liability still law applies to landowners who charge fees for entry, as long as the land is not used mainly for commercial recreation, and as long as the payment is not for exclusive use, such as club membership or event venue or campsite rental. 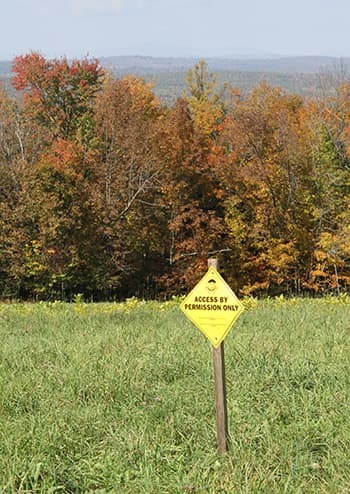 If hunting is your only concern, posting your property with signs that say "Hunting by Permission Only" with your name and telephone number is much more preferable to the public than posting No Trespassing signs — and the setup can benefit you, too. Allowing use by permission puts you in direct contact with people using your land. And those people who are willing to reach out and ask for permission are usually also more inclined to help you by reporting acts of abuse and trespass by others. MDIFW encourages users to fill out a sample courtesy card (PDF), but you can also ask to have users give you the registration numbers of the vehicles they'll be using, and/or use the request as a face-to-face opportunity to advise them of any unsafe areas on the property that they should avoid (e.g., areas where animals are pastured, woodcutting operations, or acreage with houses nearby). You also may specify conditions under which you'll allow hunting. Examples could include no motor vehicles, foot traffic only, only a certain distance from dwellings, or by certain methods only.